Yes, BMW has gotten into the more conventional and roomy upright cars. With the arrival of the new BMW 2 Active Tourer imminent, BMW are marketing against the likes of the Mercedes B-Class where the more upright design allows for a greater capacity of interior room and luggage carrying capacity. The new BMW 2 Active Tourer will appeal to a wide variety of people who may have a small family or need extra space for putting things like tents, gazebos or a mountain bike inside the cargo space. An elegant and upright design will also appeal to the older group of people who appreciate a nice large entrance for slipping in-and-out of the front and rear seats. A move in the right direction, the new BMW 2 Active Tourer creates a new horizon for BMW to reach into market areas that have traditionally been home to Japanese and other popular European car manufacturers. BMW will keep up the goodies for the BMW 2 Active Tourer. Driver aids like Head Up Display and Navigation Plus are standard features. The Head Up Display is a great safety feature that helps keep the driver aware of approaching objects in the windshield ahead of the driver. The Heads Up Display transparently projects your speed, directions and collision warnings within your field of vision in the windshield. Keeping the driver’s eyes looking ahead and on the road is a key feature of Head Up Display. 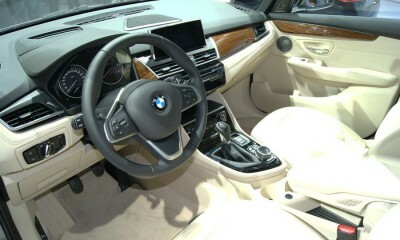 BMW Navigation Plus has an easy-to-use touch screen boasting a wide range of useful features. You can also take the unit outside the car for limitless mobility. Another change from BMW’s usual game plan is that the small 2 Active Tourer adopts the new transversely mounted engine with a standard front-wheel drive set-up. This layout has never been used by a production BMW before, however this is the first of many new BMW models that will use this new engine and drivetrain layout. Crisp handling and powerful engines still enable the new 2 Active Tourer to act friendly for the driving enthusiast. Exactly which models of the new BMW 2 Active Tourer BMW will be selling in Australia remains to be seen; however the favourable number of models available shows that there will be plenty of choice. BMW is going to offer the 2 Active Tourer with a feisty 1.5-litre, turbocharged three-cylinder motor that is used in the Mini range. Performance and economy will go hand-in-hand. Also used in the Mini, the four-cylinder Diesel unit will also power the 2 Active Tourer. Some very exciting small engines will appear in the BMW 2 Active Tourer in 2015; these being four-cylinder petrol and three-cylinder diesels. Front-wheel drive and a six-speed manual gearbox will be standard, while an eight-speed automatic option will also be available. BMW will also make the small 2 Active Tourer with a range of four-wheel drive variants. Having the added traction will be another great way of enhancing the appeal of the new BMW 2 Active Tourer. 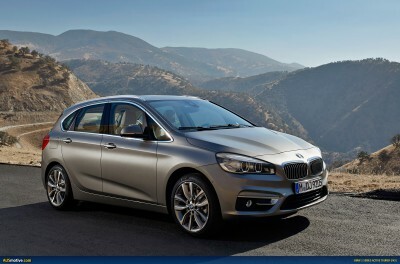 Models that are likely to make it to Australia are the: 218i Active Tourer and the 218d Active Tourer. Initially, BMW will make the 225i Active Tourer the top-of-the-range model, capable of covering the 0-100 km/h dash in around seven seconds. As you can imagine, none of these models are going to need an awful lot of fuel to ease their appetites. In 2015, BMW also suggest that additional front-wheel-drive 220i, 216d and 220d versions will be produced, as well as the 225i xDrive and 220d xDrive models boasting AWD traction. I have to say that the xDrive BMW 2 Active Tourer models sound like they’ll be great little machines – particularly over a range of variable road surfaces. Exact BMW 2 Active Tourer models are yet to be realised in Australia, however we’ll keep you posted. For any more information on the BMW 2 Active Tourer, or for that matter any other new car, contact one of our friendly consultants on 1300 303 181. If you’d like some fleet discount pricing (yes even for private buyers! ), we can submit vehicle quotes requests out to our national network of BMW dealers and come back with pricing within 24 hours. Private Fleet – car buying made easy!